Founded on May 22, 1940 in Columbus, Ohio, The QUIKRETE® Companies is the largest manufacturer of packaged concrete and cement mixes in North America, and an innovative leader in the building and home improvement industries. In addition, QUIKRETE® offers related products through numerous wholly-owned subsidiaries including Spec Mix®, Keystone® Hardscapes, Custom Building Products®, Contech®, Rinker Materials, Target Technologies®, Daubois® and QPR®. Collectively, The QUIKRETE® Companies operates about 250 facilities in the U.S., Canada, Puerto Rico and South America, allowing for unsurpassed distribution and product depth. Technical centers across QUIKRETE network also ensure that professionals and consumers alike are provided with the most innovative and highest quality products available on the market. 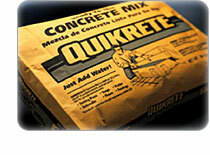 The QUIKRETE® Companies offers hundreds of professional-grade and consumer products including concrete mixes, mortar mixes, cements, concrete repair products, stuccos, floor underlayments, tile setting systems, pavers, retaining wall systems, precast structural products, hardscapes, blacktop products, sand and aggregates, and other seasonal items. These products have been used on many landmark building and refurbishing projects like the Statue of Liberty, U.S. Capitol, Alcatraz Island, Frank Lloyd Wright House, National Museum of the American Indian, Daytona International Speedway, George W. Bush Presidential Center and San Francisco Bay Bridge. For more information on QUIKRETE visit www.quikrete.com, Facebook, Instagram, Twitter, YouTube, and Pinterest.